March 11, 2019 | Rodney Carmichael -- Remember that scene in The Color Purple when Shug Avery was somewhere between the juke joint and her daddy's church, singing at the top of her lungs, and the Saturday night sinners got all mixed in with the Sunday morning saints, and it was hard to tell if they were praising the high heavens or raising holy hell? That's what Leikeli47's Tiny Desk felt like in the flesh. She came masked up, as always, the better to catch a glimpse of her soul. And there was so much soul to bare. 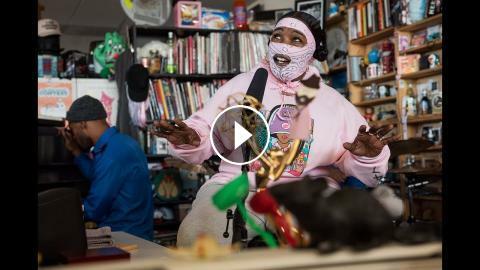 Backed by a four-piece band of bruhs dressed as uniformed TSA agents (introduced as "the TSA Band, taking flight with me"), Leikeli47 and her working-class crew proceeded to transform Bob Boilen's Tiny Desk into something akin to a pulpit or a mid-century parlor room. Portier sat hunched over the upright piano, while Justus West plucked guitar strings, Simba Scott tapped out bass lines and Timmy Manson Jr. kept everything in sync on drums. They traversed the entirety of black music, translating her hip-hop and afro-electro empowerment anthems to live instruments by jazzing up songs like "Attitude," from her 2017 Wash & Set major-label debut, and laying down the vamps on "Girl Blunt" from her 2018 LP Acrylic. It wasn't genre-bending as much as it was a musical remembering of the blues that brought her here — from the hoods of Brooklyn to down-south Virginia and everywhere else she's called home. In an era when women are no longer the anomaly but rap's new standard bearers, Leikeli47 deserves all the praise for pushing the genre forward with both feet steeped firmly in tradition. "Let's Go Get Stoned (Portier's Vibe)"